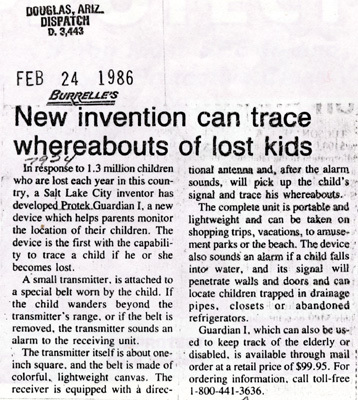 In response to 1.3 million children who are lost each year in this country, a Salt Lake City inventor has developed Protek Guardian I, a new device which helps parents monitor the location of their children. 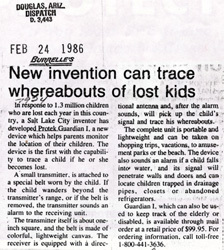 The device is the first with the capability to trace a child if he or she becomes lost. A small transmitter, is attached to a special belt worn by the child. If the child wanders beyond the transmitter's range, or if the belt is removed, the transmitter sounds an alarm to the receiving unit. The transmitter itself is about one-inch square, and the belt is made of colorful, lightweight canvas. The complete unit is portable and lightweight and can be taken on shopping trips, vacations, to amusement parks or the beach. The device also sounds an alarm if a child falls into water, and its signal will penetrate walls and doors and can locate children trapped in drainage pipes, closets or abandoned refrigerators. Guardian I, which can also be used to keep track of the elderly or disabled is available through mail order at a retail price of $99.95. Copyright © 2001-2005 Woody Norris. All rights reserved.